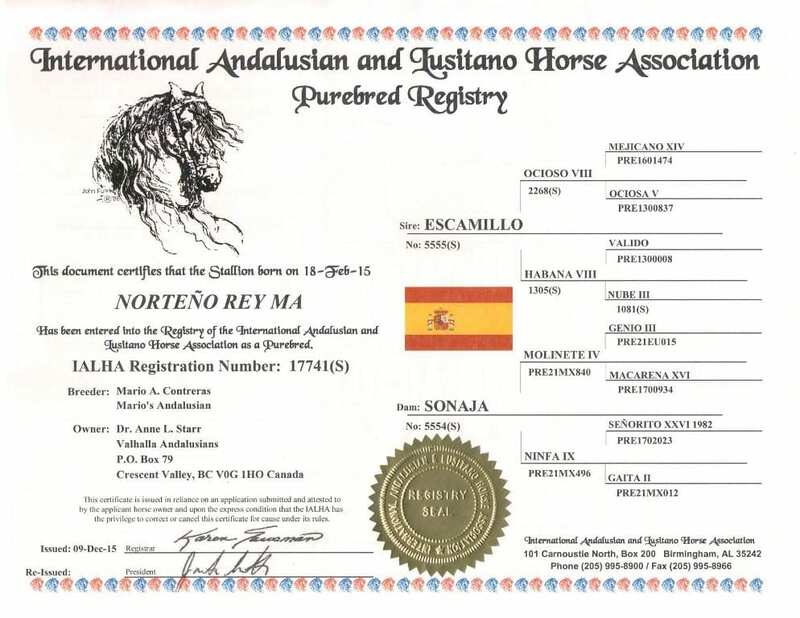 Introducing ”Norteño Rey MA” – Our stunning 2015 Spanish approved PRE grey stallion standing 16.3 HH as a 3 year old. Shown in 2017 at the Andalusian World Cup in Las Vegas, Norteño was the unanimous Champion 2 year old Colt and Gold Medal Movement Winner. He was also shown at the Canadian Nationals in 2017 and was the National Champion 2yr old Colt and Gold Medal Movement winner. Norteño’s sire Multi- National Champion stallion Escamillo and his dam is US Multi-National Champion mare Sonaja. He is a full brother to Brioso MA – the only stallion in the US to win all four titles – National Champion Colt, 2 and under, National Champion Jr. 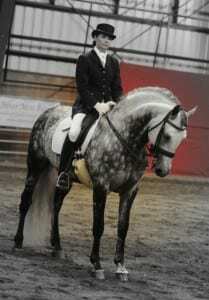 Stallion, National Champion Sr Stallion and a unanimous National Champion Best Movement. 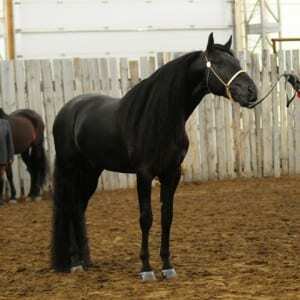 Norteño also was the Candian National Champion Andalusian Colt, 1 year and under and Gold Medal Movement Winner at his very first National show. Norteño will be standing at stud to a limited number of select mares in 2019. Believe us…….HE IS WORTH IT !!!. Norteño Rey MA – US and Canadian National Champion in Halter and Movement. 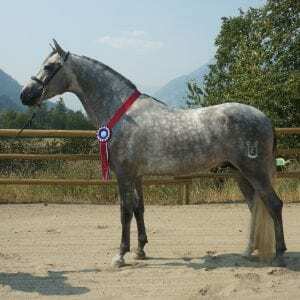 (SOLD) Mystique’s Manolete is an outstanding 2003 Grey PRE stallion. His beauty, strength, conformation, and his superbly elevated movement, are what make him the superstar that he is. Manolete was very comfortable in the show arena. Starting as early as a yearling, Manolete was awarded the grand slam in the halter world. He won Canadian National Champion Colt, 2 and under, NC Jr Stallion and NC Sr Stallion twice as well as numerous gold medals for movement. He also went on to win over a dozen National titles in performance over the 3 National shows he went to while under saddle. 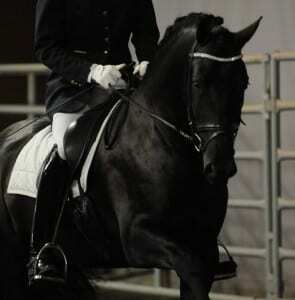 NC English Pleasure, NC Dressage Suitability, NC Show Hack, NC Dressage Hack just to name a few. 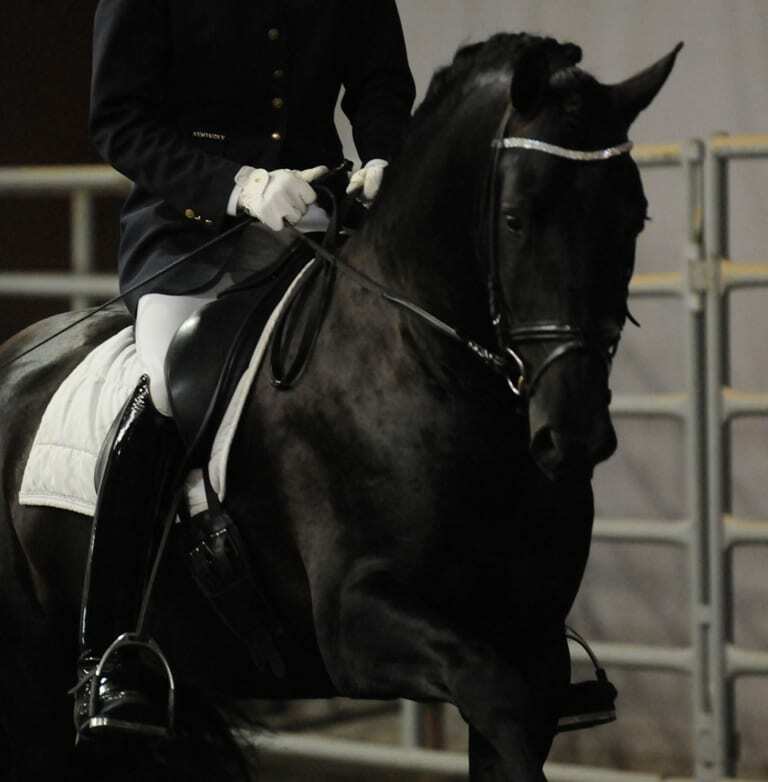 He was also shown at open shows in dressage by both Olympic rider Ms. Leslie Reid and Mr. Sven Smienk scoring in the 70’s up to 3rd Level. Manolete’s sire, Sandokan, is a four-time winner at the IALHA nationals in Texas including two National Champion and two Reserve National Champion Halter titles. His dam, Mystique’s Leyenda, is also a multi-title winner, including Grand Champion Filly 2000 IALHA Region 2, Top Five Filly at the 2000 IALHA US Nationals and Grand Champion Senior Mare and Gold Medal Movement at the IALHA PAAHL Canadian Show in 2005. In addition, Manolete’s grand-dam Linda was the first horse ever to win Grand Champion Filly as a yearling at the 1992 IALHA US Nationals as well as 1997 Reserve Champion Mare at the IALHA US Nationals. It was with great sadness that we sold Manolete to Mr Bob Price of Chicago in 2010 but it was the right thing to do as Manolete has an opportunity to reach his potential in the dressage world that he wasn’t able to do here in the Kootenays. Manolete has produced some very special offspring for us to help carry on his legacy.